At its annual meeting in January, Blackstone Heritage Corridor’s Board of Directors named Devon Kurtz its Executive Director. Kurtz has been serving as BHC’s Deputy and Interim Director since April 2018. 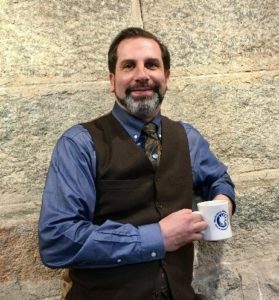 Whitinsville, MA (January 24, 2019) – Blackstone River Valley National Heritage Corridor (BHC) has named Devon Kurtz its Executive Director and made new appointments to its Board of Directors. At its annual meeting in January held at the Blackstone Valley Chamber of Commerce, the Board voted to advance BHC’s Deputy and Interim Director Devon Kurtz to the position of Executive Director. Kurtz joined BHC in 2014 to develop the exhibits and interpretive plan for its new visitor center in Worcester, MA, which recently opened in November, 2018. Prior to joining BHC, Kurtz served as the Director of Public Programs for the Higgins Armory Museum and Concord Museum following twelve years as the program coordinator for Old Sturbridge Village. In his new role, Kurtz will be a dedicated steward of BHC’s environmental resources, an interpretive partner with the National Park Service of the region’s history, and a committed advocate for the region’s economic development and progress. The Board of Directors also elected officers: Chair, Richard H. Gregory III; Vice Chair, Richard T. Moore; Vice Chair, Dennis Rice; Secretary, Todd Helwig; and Treasurer, Gary E. Furtado. BHC’s Immediate Past Chair is Harry T. Whitin. Directors re-elected for a 3-year term on BHC’s Board include: Lee Dillard Adams (MA), Jeannie Hebert (MA), Richard T. Moore (MA), Donna Williams (MA), Harry T. Whitin (MA), and Robert Billington (RI). Other members of the Board include: Joseph Barbato (MA), Michael D. Cassidy (RI), Allen Fletcher (MA), Richard H. Gregory III (RI), Todd Helwig (MA), Bill Beitler (RI), Pieter de Jong (MA), Gary E. Furtado (RI), Dennis Rice (MA), Robert Dandrade (MA), Thomas Kravitz (RI), and Yvonne Chita (MA).